My stepdaughter, Kaylee, has been here all week and anytime she is here I step up my cooking. This week I tried three new recipes; one from my Sept. Vegetarian Times and two from Alice Waters' In the Green Kitchen. 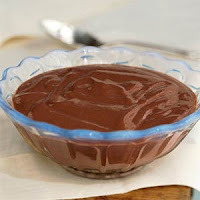 All were delicious but the most adored recipe was a Vegan Chocolate Pudding from VT. It was completely unfair to pit this mouth-watering chocolate recipe against two other very good choices so you can find their recipes at the end of this post. Several of us dreamed about the pudding that night after eating it and talked about it the next day. This warm stove-top pudding packs a punch of deep chocolate flavor. It's the perfect recipe for a quick company dessert or a simple nighttime treat. Whisk together brown sugar and cornstarch in medium saucepan. Gradually stir in hazelnut milk, whisking constantly to combine. Bring mixture to a boil over medium-high heat, or until mixture thickens. Stir in vanilla, and remove from heat. Add chopped chocolate, and let stand for 1 minute. Stir until smooth. Mine didn't thicken as much as I thought it should. We called it chocolate soup but licked our bowls anyway. Now I have to try, try, try to make this again and see if I can perfect it! Oh, the tribulations! Here is the Lentil Soup recipe. Here is the Apple Galette recipe. I've loved paging through In The Green Kitchen and am thinking I might have to buy it. Waters' has it set up with an informative opening about what a green kitchen is and how to stock a green pantry with a great list. Each featured chef has their own section, with their green cooking tip; something like David Tanis' Simmering Beans advice followed by his recipe for White Beans with Garlic and Herbs, which I plan to make this week. 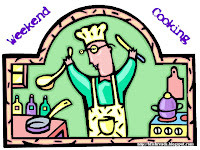 Weekend Cooking is a weekend meme hosted by Beth Fish Reads. Any food related post can join in-click on her link and take a look at all the other foodie-posts!